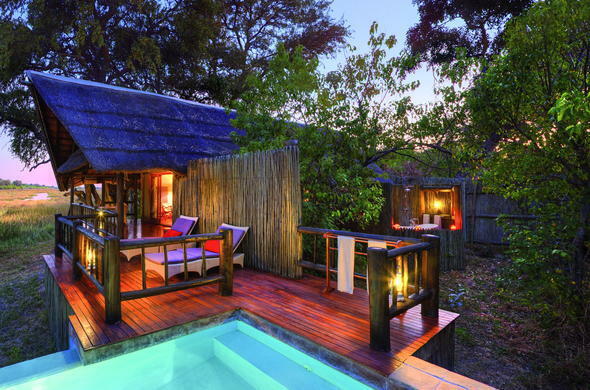 Khwai River Lodge is one of the oldest safari lodges in Botswana. Khwai River Lodge is one of the oldest game lodges in Botswana. It is located 8km (4.9 miles) north-west of the north gate of the Moremi Wildlife Reserve. The camp is set under a canopy of old indigenous leadwood and fig trees and offers a commanding view of the Khwai River flood plain. Khwai River Lodge is the perfect location for observing the perennial drama of the African bushveld and provides excellent bird watching opportunities. For decades, as one of the most established game lodges in Botswana, it has hosted guests from all over the world on the safari trail. At Khwai River Lodge you are at the centre of a world that has not altered since life began, immediately sensing its big game heritage. A holiday is no fun without relaxing with bush hats and desert boots, tall tales and sundowner drinks. Moremi was once the traditional hunting ground of the Batawana Tribe who, in 1963, as a result of their great love for the wilderness, proclaimed this area protected wildlife sanctuary. Hippo, Elephant, Antelope and numerous species of birdlife abound on the riverbank and the floodplain in front of the camp. The public areas of Khwai River Lodge consist of a thatched dining room, bar and lounge with an open fireplace. Outside there is a second fireplace alongside the teak viewing deck, a heated swimming pool and a secluded viewing platform, which overlooks the river. Morning and afternoon game drives into Moremi Wildlife Reserve provide excellent sighting opportunities, whereas night drives conducted outside the Reserve, provide an opportunity to view lesser known nocturnal creatures by spotlight.